I have lived on the East Coast for over four years now, and just this weekend had my first New York City adventure. I know, I know, take a moment. What??? You have lived within 4 hours of NYC and you haven't been??? The fact is, the whole concept of New York totally overwhelms me. I can't just go for a weekend, like all my friends urged. There's so much to see! I wouldn't even know where to start! I felt about NY the same way I feel about China - it's just too much, I don't even want to deal with it. But upon the urging of many, and thanks to a friend with a car (Mer) and a conveniently-located cousin, I finally did NYC. "No, we are ripping off this band-aid. We are going to NY and damn it, we're going to have fun!" I could probably write a small book of the weekend. But, since I doubt anyone really wants to read a book-o-Mollie, I will just share a few key points that amuse me. 1. An overweight man frolicking down the street (in front of the windows of our restaurant) wearing a neon pink full-body unitard. 2. A pole-dancer on a cart. Bear with me on this one: There was a man peddling a bicycle, pulling a cart to which was affixed a pole. An average-looking girl (as in, she was not a "professional"), pole-danced to the music of Usher blaring out of their stereo. Up and down the street. In public. WTF?? 3. A man with a cat on his head. Again, I kid you not. He had a black cat on a leash perched on his head as he walked down the street. Yes sir, I am going to stare. Because you have a cat on your head. Subtlety is clearly not your goal. When you tell people that you're going on a hike, it's expected that you will be doing something relatively hard-core. We actually ended up spending a lot of our time in and around Time Square (not because it was on our list of things to see, but because Time Square is where you go for Broadway tickets). I do not usually like crowds, or flashing lights, or loud noises. However, in the right context - aka Disney Land, or NYC, I can appreciate the sheer shininess of it all. After our second show, we needed to kill some time before we met Mer's cousin. So we went to M&M World. It's a store of everything M&Ms. FULL of people. Usually that sort of thing would horrify me, but since I was in New York-Disney mode, it was just part of the experience. While walking around East Village with our hosts, the subject of cake came up in conversation (as it so often does with me). 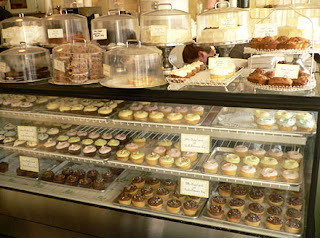 They took us to the famous Magnolia Bakery, which I expected to be overrated and over priced. It was neither. Frankly, it was one of the best pieces of chocolate cake I have ever had! (I know, bold statement.) And for only $3.75! We went again the next night after our Broadway initiation (thank you Mary Poppins). My friend had made the silly mistake of ordering a cupcake rather than a piece of cake the night before (you all know how I feel about the cupcake/cake debate). So, yum! Cake again - this time chocolate for her, and pumpkin with dried cranberries and cream cheese frosting for myself. And then (this is the best part) we were meandering around near Rockefeller Center on our last night, when I saw on the sidewalk ahead of us what looked like someone with trays of cupcakes on the street. WHAT? Yeah, Moz, I know, we saw that Magnolia yesterday. And then I started running (because the free cupcake man was heading back inside!). Luckily, I am a runner. Thus, said cupcakes (chocolate with chocolate frosting) were soon in my and Mer's hands. For free. YES! Thank you closing time! And now I am back in DC. Alive. Nothing disasterous occurred, my fear of NYC is cured. 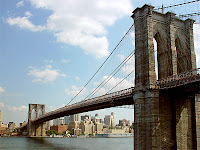 The myth is demystified - I can now say that I have been to New York City, and damn it, we had fun!